We try to catch big fish all the time!! So why not let 'Capt Fletch' take you to where the big ones are? 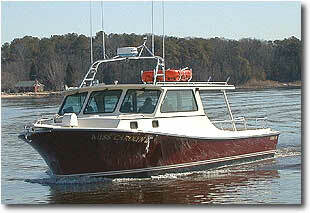 We also go bottom fishing and chumming for rockfish and bluefish. In the fall we live line if possible. 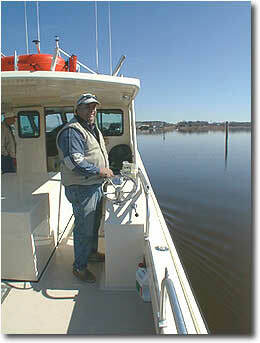 Captain Wayne "Fletch" Fletcher has been fishing the Chesapeake Bay for over 50 years. His goal is to make your trip a memorable one. Capt. Fletch doesn't like to go home empty handed and will go the "extra mile" to insure a good day! Captain Fletch holds a US Coast Guard Master's 100 ton license. Miss Carolyn II is a 2003 42 foot Jones fiberglass boat built to U.S. Coast Guard standard and certified to carry up to 26 passengers. She is powered by a 420 H.P. Caterpillar engine. Miss Carolyn II is outfitted with state-of-the-art equipment including Furino radar, depth finder, Garmin chart plotter, stereo system and ICOM VHF radios. For your comfort, the heated cabin with seating capacity for up to ten passengers provides protection from any inclement weather. Her first-rate enclosed head, galley, and cabin have many of the features of home including running water, refrigerator and microwave. We normally fish five to ten miles from Rock Hall Harbor, about a half hour to one hour ride. We normally fish five to ten miles from Rock Hall Harbor, about a half hour to one hour ride. The only method to catch the big ones in the spring is to troll. When it comes time to chum we bottom fish in the area from the Bay Bridge north. We also use live bait (commonly known as live-lining) when available at no additional cost to you beginning in August thrrough the fall. ...And when a great day of fishing is over, you might try a drink and excellent meal at the Harbor Shack, right on the waterfront. You'll love the outdoor dining, great menu and live music on weekends. Want to enjoy an evening on the water but do not plan on fishing? Contact us today regarding our sunset cruises. We are also happy to accommodate custom cruises. Cruises can be scheduled to depart from Rock Hall or Kent Island. Call for details!